I'm obsessed with nail art. I bought the whole brush set I have a wall rack of colors and I always try out new nail art designs. It's become my thing. I also have appeared to start a trend among friends who also want fabulous nail designs. YAY! Inspiring the masses. I have a manicure night once a week with my darling friend Jenn and last night she said she wanted something summery, strawberries or lemons or something fun and bright. 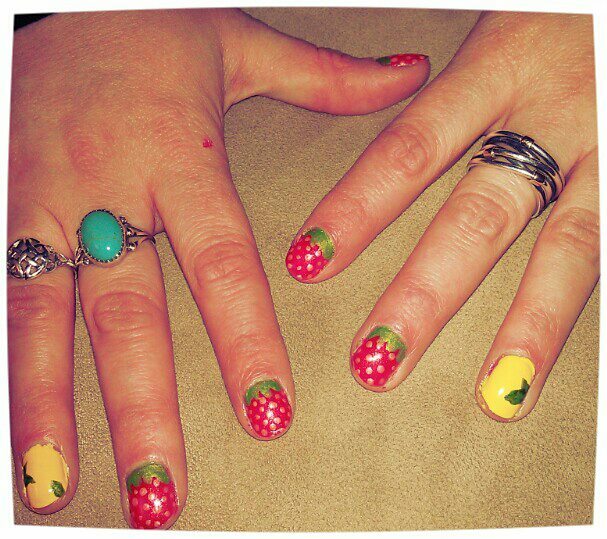 The result of this request was Strawberry Lemonade. Adorable!! And certainly unique!! I wish I could do nail art-but unfortunately I am all thumbs and can barely get a single color on my nails. Ha! Great sense of humor. Makes me ready for summer. You are fabulous, I love the strawberry! I think it says summer. So cute I do not have that talent.